Resistance spot welding is a quick and efficient way to bond sheet metal together. 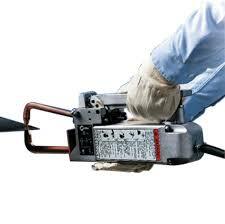 The Miller LMSW-52T is a 220V spot welder with timer panel (0-5 seconds). Our unit has 12″ tongs. In this configuration, a maximum of 1/8″ of metal thickness can be welded (e.g., two 16-gauge mild steel). Output current is approximately 5,800A (according to Miller’s website).